In my own art I’ve been playing a lot with the concept of revisiting previous things, transforming pieces of art into something new, and pushing past something that feels like it’s failing. 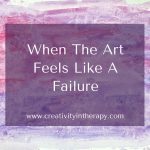 The last post shared general ideas for how to manage the concept of “failure” in art and art therapy, and I mentioned that one of the things I try is revisiting the art later and trying to transform it into something new. So post is a glimpse into how I’ve been playing with this in my own art. 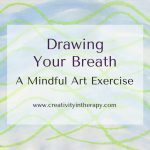 My hope is that it can give you some ideas and inspiration for either your own art-making or your work as a creative therapist. 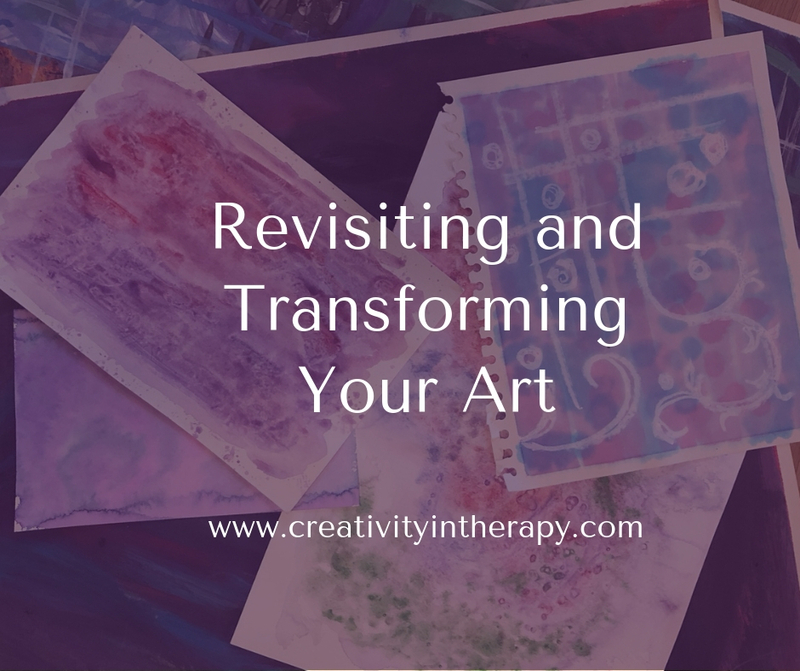 What types of art could you consider revisiting and creatively transforming? 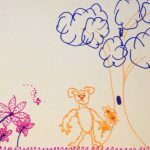 I’ve used art pieces that felt like “failures” for some reason, pieces that resulted from experiments with technique or process-focused art, incomplete art that was abandoned when I felt stuck or uninspired, and even a few of my old art pieces from school. Working with limits and what you have. Starting with the limitations – a certain object, material, or rule – and pushing yourself to make something new is a great way to stretch your creativity and lead to new ideas. Facing discomfort. It can sometimes feel uncomfortable to sit with something that we would have rather thrown away. But working with it through the art process can encourage us to face that discomfort to get to something new. Practicing incubation and flexible thinking. 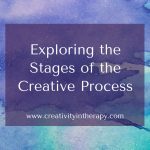 In the post about the stages of the creative process, I shared about the importance of giving ourselves times to incubate ideas and then be flexible in our thinking as we create. Figuring out what I can do to take a piece of art I don’t really like and make in into something more definitely takes both of these skills! Moving past a stuck place. When we get stuck in life or in the art process, sometimes it’s easy to just give up. But it’s a valuable skill to be able to push yourself through that process. Being able to work through the stuck places in our lives are the only way to really grow. Sometimes art that we don’t like is just in a stuck place and continuing to work with it will lead to something great. Seeing something from a new perspective. When we give ourselves time and space from something and then revisit it, we often get new ideas and insight (again, this applies to both art and life in general). New knowledge and skills can help us approach a problem – or art piece – in a different way. Below are some of the examples of my “transformed” art. 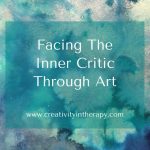 I hope they can give you some inspiration to try this for yourself, whether it’s a way to work past a “failure” or simply as a creative challenge for yourself. 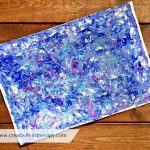 This original art piece was created as part of a group art experiential while doing a book study with some other art therapists. It really bothered me how ugly it was, so I wanted to find a way to transform it into something that I liked. The primary shapes were cut out and became flowers for my altered book. This original art piece was from several mandalas that I created with dripping liquid watercolor. Although some of the larger ones ended up in an art show, the smaller ones weren’t really complete art pieces. I saved them to incorporate into new projects later. This one reminded me of the sun peaking through clouds, so I glued it into an art journal and continued the picture. This altered book page contains two different “failures.” One was the result of playing with watercolor and salt, but it didn’t really become a completed artwork. The other was the bright pink background created in the altered book. After making the background, I couldn’t decide what to do with it for several months. I was frustrated that I felt like I had ruined the page, but decided to find a way to make it work. I love this result because the materials really pushed me to be creative and not give up. I worked on it in several stages because I would feel stuck for a few days and then come back and do more. This is a piece I am starting for an upcoming art show – our annual South Texas Art Therapy Association art show will be in conjunction with E.A.S.T. (East Austin Studio Tour). I originally felt really stumped about how to respond to our theme of “A Compassionate Community.” But then realized that my current interest in altered books and transforming my previous art would fit nicely. 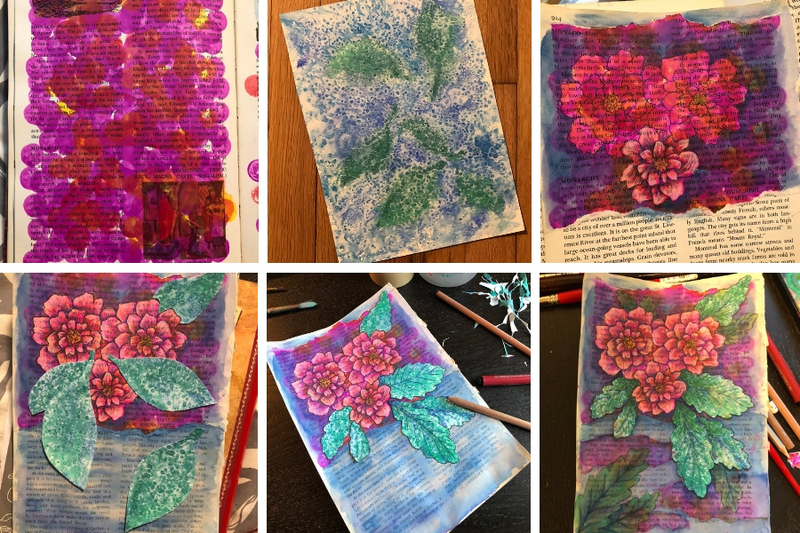 I have gathered up a selection of previous artworks (some about my family and my emotions from my grad school art therapy studio class) and incomplete experiments, tearing them up and recreating them into roses that will go into an altered book (a book about therapy). In working on it, I am reflecting about how therapists honor the stories we tell and the past experiences that we have lived (both the ugly and the beautiful), knowing the growth and transformation that can arise from it. Share your thoughts below! 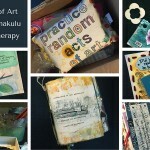 Do you ever re-purpose or transform your previous artworks, failures, or experiments? 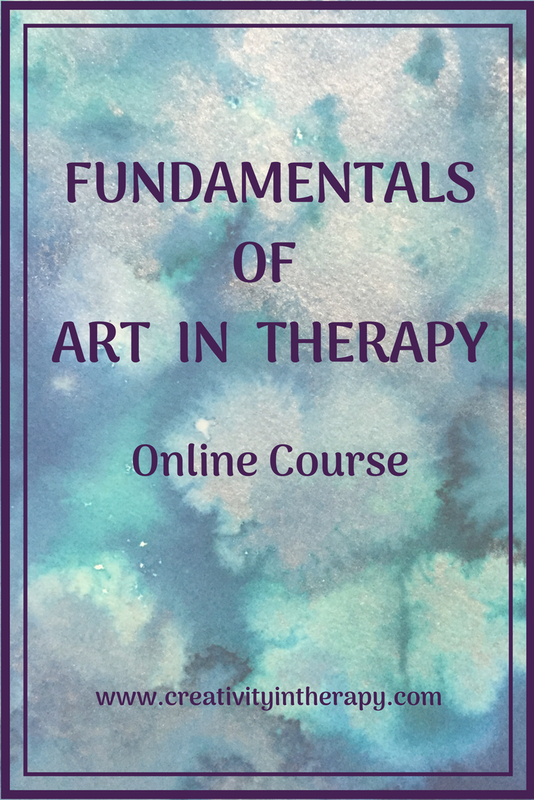 The next session of my online course Fundamentals of Art in Therapy is now available for registration. The course will start October 13th. 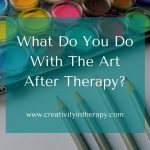 If you want to deepen your knowledge about using art and creativity to help your clients, head over to the Courses page for more information. Thank you, April. 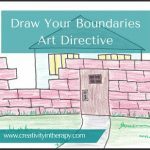 Hope that some art-making is able to help you process your situation. It may be an interesting experience to do a piece of art about how you are feeling about it, then try to change the art with a different perspective. What a great article! I revisit and transform my old art quite a bit…partially due to lack of supplies, room and world conservation. Growth and transformation definitely resinates with me and this process. Like revisiting a written journal, this exercise is very effective in the client see the forward progress in their recovery.